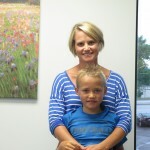 Jo has been such a fun, energetic and delightful patient to work with. She came into her 1st Vision Therapy appointment frustrated with school, reading, migraines, eye strain, blurriness and overall poor visual system. A few months into her program she suffered a concussion. Now, at her halfway point of her program she shares with us multiple improvements that she has seen. Check out the video below as she talks about relief from migraines and her improvements in school. Congratulations Jo on your success! We are excited for you and can’t wait to see continued improvement through the rest of your program. Claire and her parents talk about the many changes they have seen from Vision Therapy. Claire now loves to read, is able to play quarterback on her football team and has risen to the top of her class. Her parents, who are both in the education field, could not be happier for her. Congratulations Claire on all of your success! A mom of a child with Autism tells us about their success with vision therapy. Check it out! Evelyn and her mom describe their experience with Vision Therapy and how it specifically helped in her journey with ADHD.